Product is loaded into the machine hopper. 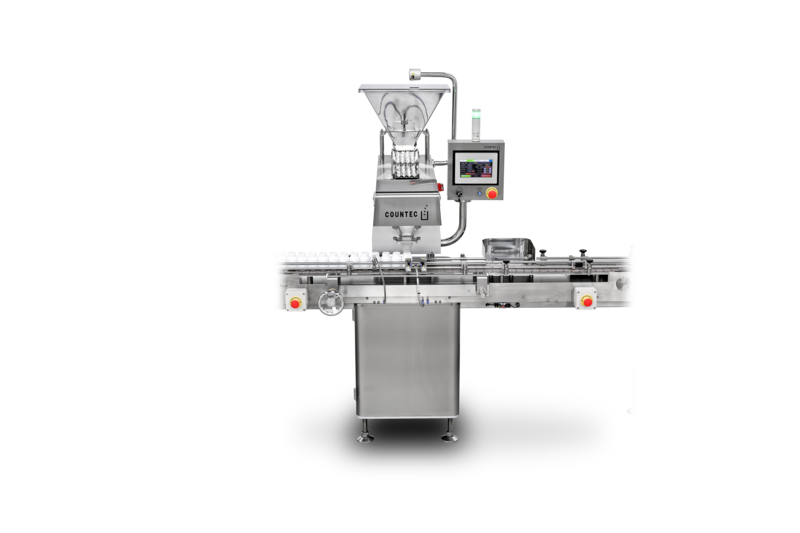 Two stepped vibrating trays controls the product feed. Tablets pass through tablet feeding guides to the counting sensor head assembly. Tablets are counted electronically as they fall through the sensor head assembly. Counting is by sealed infrared sensors. Once the tablet count is reached, the filled container is manually removed from the funnel area. The counted tablets for the next container are accumulated in the tablet guide by sequenced shutter gate movement. A flap mechanism diverts the flow upon release of the accumulated tablets into the adjacent empty container. Counting sensing system is product calibrated and utilizes light & dark time feature for enhanced accuracy. Machine speed is subject to product size and internal bottle neck diameter. ** This machine can handle up to dia. 135mm by machine modification with extra charge. ** The bottle sample checking is mendatory. ** Any bottle size out of above standard range has to be checked the samples by COUNTEC.